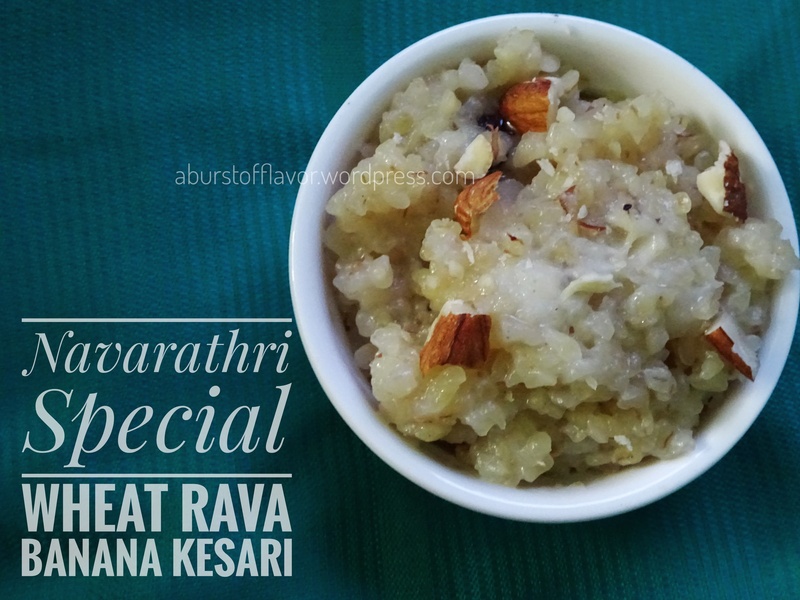 With the Navarathri festive season coming to an end, I cannot help but wonder what I would do this weekend! Navarathri has kept us so busy the last few days. I live in an apartment complex full of Tam-Brahms (short for Tamil Brahmins), so everyone here is strong on the golu game, busy wrapping up their Navarathri golu padis. The dolls are neatly wrapped in a nice, clean cotton cloth and stored away in boxes and the padi (the steps on which the dolls are seated) is dismantled. Dussehra celebrations were in full swing today, with the apartment association organizing a final lunch party downstairs (picture below). 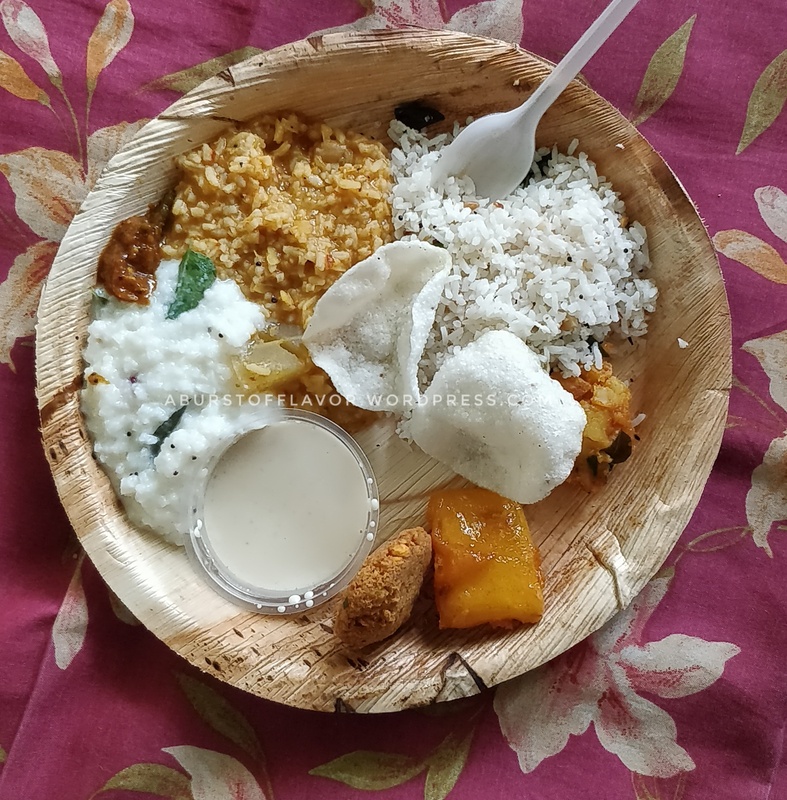 Every item on this plate was d-i-v-i-n-e; it is really no wonder they say swami prasadams (food offerings to god that are given back after worship) taste the best. Seriously, how are they always so perfect-tasting? Speaking of prasadams, what a festival it has been this year- I was lucky (and blessed) enough to relish prasadams from various temples over the last nine days (thanks to my mum). 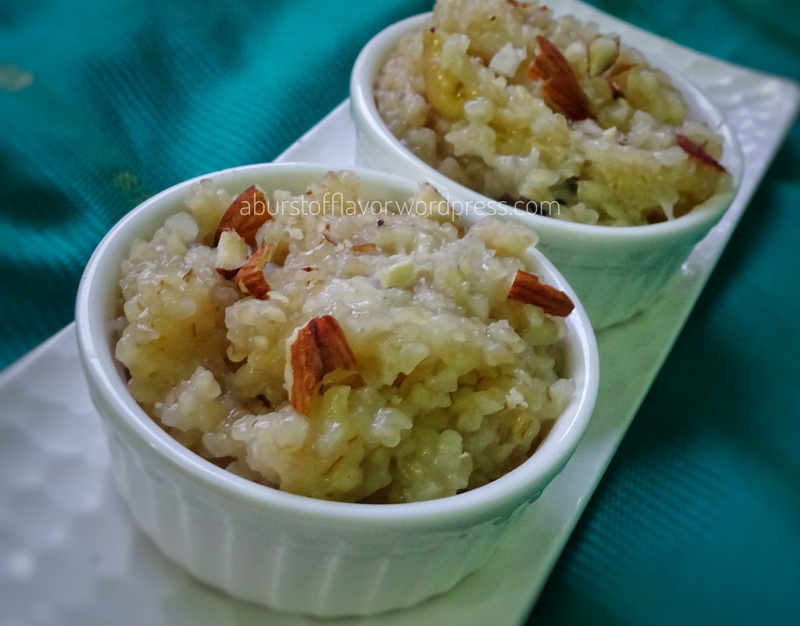 From the classic rice varieties like Curd rice, Puliogare, Lemon rice, Vangi Bhath and Sambar rice to different types of Kesari Bhath and payasam, Sakkara Pongal, Jalebi, etc. , the list is endless. Heat ghee (clarified butter) in a pan. Once hot, add the wheat rava and roast it for about 3-4 minutes in a medium flame, or until the raw smell disappears. Meanwhile, heat about 2.5 cups of water and let it come to a boil. Add the boiling water to the rava, turn your flame to the lowest setting and continue to cook it, covered for about 8-10 minutes. It will turn slightly translucent and go lighter in colour. While your rava is cooking, take a medium sized banana and roughly cut it into roundels. Add your sugar to this and mash it well with a fork, or with your fingers. Make sure the banana is ripe, as it will be the sweetest at this stage (basically, your banana peel should have brown spots on it). Once the rava has completely cooked down and has absorbed all the water, turn your flame back on medium. The Kesari would have now doubled in volume. Add your banana-sugar mixture at this stage and give it a stir. Now, the kesari will loosen up a little. Cook it until it comes to a nice pudding-like consistency. You will see the ghee separating from the mixture. Switch off and set aside. Heat another pan with a teaspoon of ghee and add your chopped nuts and raisins. Let the nuts turn a nice golden colour. Switch off and add the tempering to your kesari. Mix well and serve hot or warm. The amount of water used to cook the wheat rava could vary from one brand to another. The ratio is usually (1:2.5), i.e., for one cup of rava you would need about two and a half cups of water. Feel free to add more if required, but keep in mind that it should be boiling hot water. Add water in 100 ml increments, so you know when to stop. Make sure all the water has been completely absorbed before adding the sugar, otherwise it can get really watery and sticky. Also keep in mind that we are adding Banana AND sugar, so adjust the sweetness accordingly. Half a cup should be more than enough, but the level of sweetness varies with the brand used. Go easy on the ghee. It will really bring in a nice flavour and aroma, and you will get a really nice silky texture.